Within the moving parts of an engine, parasitic frictional losses consume about 17% of the mechanical energy, depending on the engine design, and duty cycles. While some frictional resistance is needed for the operation, the parasitic energy losses can be reduced to increase fuel efficiency. The Annex focuses on research and development activities to demonstrate that surface material technologies can be used to improve fuel economy. This includes surface textures to reduce friction, coatings to protect the textures, and ultralow viscosity lubricants to reduce the drag of engine components in relative sliding motion. Working with industrial partners, we have conducted industrial standard engine tests on an ultralow viscosity advanced lubricant to achieve 2.4% fuel economy improvement over the current commercial lubricant. The world uses 35,600 million barrels of oil per year and produces 36,061,000 kilotons of CO2. A 2 % reduction translates to an oil consumption reduction of 711 million barrels of oil and a CO2 reduction of 721,000 kilotons per year. We are currently conducting engine tests to evaluate surface material technologies using this new lubricant to assess their effectiveness. Surface texture was first used in engine cylinder liners during the 1950s to prevent seizure in diesel engines. Cross-hatching of the liner is now standard practice throughout the engine industry today. Serious research and development into surface texturing as an academic topic began in the 1990s on mechanical seals where the load is low and speed is high, and the contact is flat on flat. The application was hugely successful, resulting in significant friction reduction and much longer durability. Theory and models followed to firmly establish the surface texturing as an emergent science and technology area. 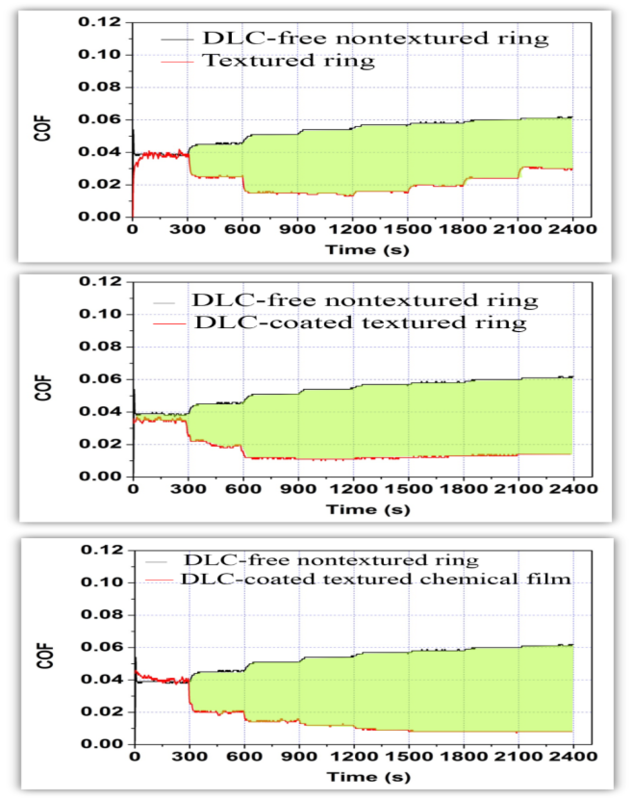 During the ensuring decade, surface texturing appears to have limited application successes. Within this environment, Annex IV was formed to share common experiences and conduct cooperative research and development activities among interested researchers and application engineers. Today, Annex IV has developed comprehensive database and mechanistic understanding of how surface texturing can be used to control friction and wear in sliding components. We are currently focused on engine testing of surface textures to demonstrate their benefits. There are several barriers facing the wide spread use of surface texturing: 1) the cost of fabrication on engine components; 2) durability of the surface textures; 3) design guidelines for complex motions sliding pair; 4) how to quantify benefits in engine operating environment. (4-7%) by using ultra-low viscosity lubricant in vehicle driving tests. While some OEMs have employed surface material technology to fortify their engines to be more wear resistant, this is not the case for all OEMs. A new ultra-low viscosity lubricant classification of the Society of Automotive Engineers (SAE) has been established in 2013 (SAE 0W-16) and a new lubricant classification GF-6 has been created to allow the use of ultra-low viscosity oils, pending the development and issuance of new engine sequence dynamometer tests to certify this class of oils. Because of the low viscosity, wear emerge as the key challenge. A new subtask on developing robust low viscosity lubricants was established in 2014 to explore novel base oils (ionic liquid, polyglycols, and liquid crystals, etc.) and more robust friction modifiers and lubricant film enhancers as a means to achieve the fuel economy gains without wear. With the introduction of ultralow viscosity lubricants in the market, concern of potential durability loss from the use of this class of new lubricants looms over the landscape. As a result of this concern, materials technology such as surface texture, diamond like coatings, and bonded chemical films are being examined closely to see whether they can alleviate wear and durability loss. 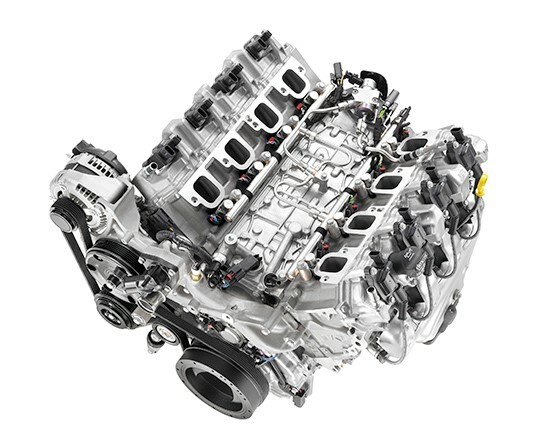 At the same time, the Annex began working with engine manufacturers to identify a modern engine with current fuel efficient features to test the effect of ultralow viscosity lubricants on long term durability. Engine being used for measurement of surface materials technology effect on fuel economy and durability. Texture fabrication technique development: The requirements for surface texture fabrication on engine components are: 1) low cost; 2) reproducible; 3) control of size, shape, and depth of dimples; 4) no unintended side effects on performance or durability. We have chosen the use microlithography mask making coupled with electrochemical etching to fabricate complex, mixed geometrical shaped discrete dimples, or lines, or grooves on steel (from cold rolled steel to bearing steel with hardened surface layers). The original method is to fabricate a hard mask (containing the texture pattern) on a silicon wafer in a clean room using photoresist and UV irradiation. The pattern is then transferred to a glass substrate and a second UV irradiation is needed to transfer the pattern onto a solid surface. This technique is typically used in making MEMs devices. However, engine component surfaces are irregular in shape, with highly curved (both convex and concave) surfaces, projection of the micropatterns onto such surfaces are not feasible. We have developed a soft mask using polymeric thin films, avoiding the need of the second UV irradiation and textures can be directly fabricated on bearing steel surface with precision. A) Optical images of the photoresist pattern on polymeric thin film surface; B) soft mask fabricated by dry etching based on the mask patter; C) circular dimples fabricated on the bearing steel surface. Mathematical surface descriptions: With surface texture design methodology developed, there is a need to address the issue of how textured surfaces can be specified for qualify control. Australia leads the effort on this aspect in the Annex. The aim is to develop a mathematical description of the textured surface which has directionality and multiple length scales. This can be described by using fractal mathematics. With 1.3B vehicles in the world today, and 86M vehicle annual production rate, the combined emission and oil consumption constitute one of the key energy sectors. Reducing oil consumption by fuel economy improvement is one of the key strategies to reduce oil consumption and carbon emission in the near term. Friction surface technology and ultralow viscosity lubricants can have a significant impact on world energy consumption.